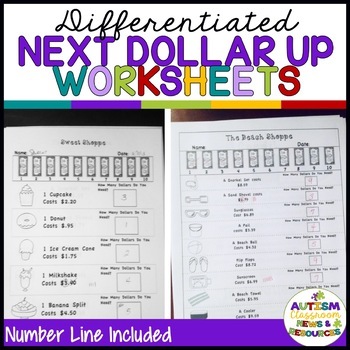 Download the preview for 2 free Next Dollar Up (money) worksheets as samples as well as the key. The product package contains a total of 10 black and white worksheets. There are 3 worksheets with amounts to $5 and 7 worksheets with amounts to $10. Students can use the number line of the dollars at the top to count how many dollars are needed. These worksheets are designed so that the students use the Next Dollar Up strategy to determine how many dollar bills are needed to buy a product. Using this strategy, you look at a price (say $1.50) and you give one more dollar than the number of dollars in the price (you give $2). So, if you want to buy something that has a price for 4.50, you give $5 and get back the change. I developed these worksheets as a functional curriculum teacher resource for middle and high school students in special education who are working on understanding money. 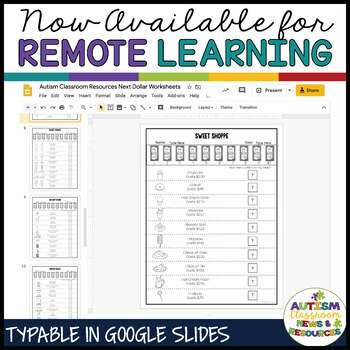 The set would work well with younger students as well as part of either the core curriculum or to meet IEP goals. For more ideas about the Dollar Up Strategy see my blog post. 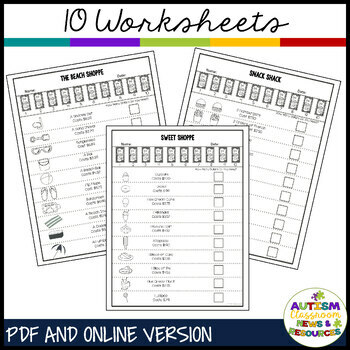 For more ideas and uses of the worksheets, please see my blog at Autism Classroom News. I will be making more of these types of resources for older students. To keep up with new products, follow me at TPT or like my Facebook Page. Also, don’t forget to leave feedback! Thanks for your interest in the product. Next Dollar Up Worksheets: Money Skills (Special Education) by Christine Reeve is licensed under a Creative Commons Attribution-NonCommercial-NoDerivs 3.0 Unported License.